Join us at the Community Center for our annual Cemetery Theatre. Some well-known residents of the past will be portrayed by family members or volunteer actors. Always a crowd pleaser! Refreshments and social hour will follow the presentations. There will be a $5.00 admission fee. The Depot Museum will be open at Heritage Park during the Holiday Open House. Stop in to view the museum and enjoy hot chocolate. A sleigh will be available outside for photo opportunities. Interactive Puppet Tour! Learn about puppets and local history, all at the same time! With local children acting as puppeteers, Eulenspiegel will replay historical episodes in each of the following buildings in West Liberty’s Heritage Campus: the depot, barn, one-room schoolhouse, and Highway 6 cabin, with each building featuring a different style of puppetry. After this premier performance, the "Interactive Puppet Tour" will be available to groups touring the Heritage Campus. Heritage Park, 407 N. Elm St. 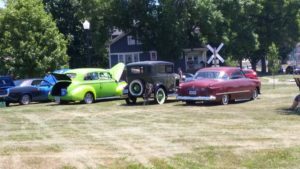 The annual Father's Day Car Show will be held in West Liberty Heritage Park. Any car, any age, any condition welcome. There are no classes, no prizes, - just car talk. The Train Depot Museum and other Heritage buildings will be open during this event. Enjoy the afternoon viewing some things from Dad's and Granddad's day! Come on down to see some fantastic cars, participate in a trivia game, have some Yotty bars and other refreshment. If you have a car you'd like to show off, bring it on down. The West Liberty Fire Department is sponsoring train rides from the West Liberty Depot to Durant and back.